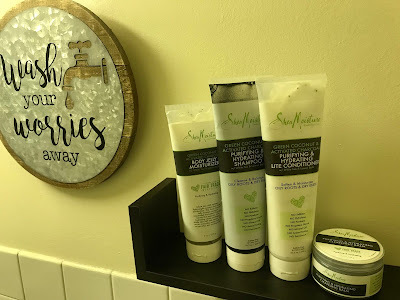 mommygorjess: ME time with SheaMoisture Green Coconut & Activated Charcoal Line! ME time with SheaMoisture Green Coconut & Activated Charcoal Line! I am a mom. A working mom, a devoted one. I wear SO many hats. Honestly I dont know how I do it, but my juggling skills are on point. Seriously! I work full time, and I make sure I am very hands on with my two very adventurous boys. All my boy moms out there know, it gets pretty insane, and messy- very messy. I literally take a breather and sit down for a minute, but instantly here MOM being yelled 10 times. There are no breaks, no breathers. I love being a mom, and I knew this was going to be my life as a mom because I understand how demanding parenting is. No complaining here, just venting. I do believe this was the life for me, and I was fully meant for it. God knew what he was doing when he made me a mom of two boys who just cant get enough of me, ever. With that being said, I do love when bedtime rolls around. I am one of those people who absolutely needs a night time bath to fall asleep better. Its impossible for me to go to bed without one. I need that down time to wash away the day, and feel refreshed and calm. So once the boys are off to dream land I know I must make the best of the time I am getting. I take my baths/showers VERY seriously. The peace and quiet I get out of it is life changing for me. I love it! When SheaMoisture sent me over their new Green Coconut and Activated Charcoal line I was so excited to use it all up in one night. I wanted to try it all, and soak in the scent. So, I did.. because YOLO. (I apologize if this saying isnt cool anymore, Im getting old - and very uncool as my oldest would say!) I started off by using the Purifying and Hydrating Shampoo and Conditioner. It smelled amazing, and really deep cleaned all the oil in my hair and excess product buildup that I tend to have trouble with usually. Then I fully washed my body down the with the cleansing bar soap. I loved how much it lathered and got super foamy. The best part is its been about 3 months and it is still as if I have never used it. I love that its lasting soo long. On days when I want to sit in the bath though I use the Bath Salts, and a little goes such a long way. Infused with skin invigorating white tea and lemon balm, this dual action formula creates a purifying and hydrating bath or foot spa experience. Sea Salt helps relieve and rejuvenate skin. My all time favorite product from the SheaMoisture Green Coconut & Activated Charcoal line has got to be the Jelly Moisturizer. It infused my skin with extreme lightweight moisture that meets purification. This Fresh Coconut Jelly formula contains suspended Activated Charcoal beads that melt into skin, hydrating while soothing to make skin soft and supple. I use it as an everyday moisturizer or as an after sun cooling treatment after the pool or beach. Just recently I shaved, and rubbed on the jelly moisturizer all over my legs and I loved just how soft it left my legs. It works as a perfect after shave gel! I am honestly always so amazed at how many different products SheaMoisture can come up with, and the simple fact that they are all made with Fair Trade ingredients, and WORK is just unexplainable but awesome! I really cant get enough of them, and they will forever be my go to company for all things pamper! This momma feels brand new after using all these products that create a super hydrating and nurishing bath experience. - All products were sent to me from SheaMoisture, but opinions are of my own, and 100% Honest! Fun and Easy Family Cooking with Loisa! Game Night with Goliath and Pressman Games! Let's all be silly together!